Tonight, the Wenatchee AppleSox play their first home game of the 2018 season against the River City Athletics at Paul Thomas Sr. Field. This will be the second straight year that the AppleSox and Athletics clash, with Wenatchee taking both meetings last year. 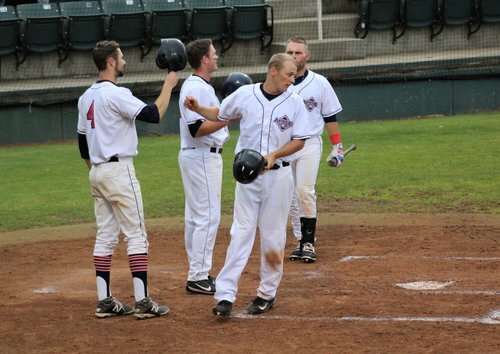 This past weekend, the AppleSox opened up the 2018 season by taking two of three from the Victoria HarbourCats at Royal Athletic Park. Grady Miller tossed six shutout innings on Friday and a double-steal provided the game-winning run. After dropping the second game of the three-game set, the AppleSox bounced Sunday, Hunter Boyd struck out eight batters in seven strong innings and took a no-hitter into the fifth inning. The offense scored 14 runs and capitalized on six errors by the HarbourCats. Tyler Chipman, a Cashmere native and incoming freshman at Gonzaga, will get the ball in tonight's home-opener. Chipman, a 2018 Rawlings-Perfect Game Honorable Mention All-American, recorded a 0.93 in three appearances (15 innings) this past year for Cashmere High School. Following tonight's game, the AppleSox will remain in Wenatchee for two more games against non-league opponents. Wednesday, they will face the Northwest Honkers and then the Highline Bears on Thursday. Tickets to these games can be purchased in-person at Paul Thomas Sr. Field or online at applesox.com.